Salted Caramel Game Day Marshmallows. I didn’t really grow up a huge football fan, but when I moved to Boston for college I began to see a lot of the appeal. The winters here are cold, and hibernating with your friends and family on the couch on a Sunday afternoon to watch the game is a pretty nice way to spend your day. Also: football snacks. Yea, it’s the snacks really sold me on the whole football thing. I’m always looking for new treat ideas to bring to family and friend’s houses when we’re over for a Sunday afternoon hang, and that’s where the idea for these football marshmallows came from. The recipe is in the new issue of Family Circle Magazine on stands now! I decided that our cocoas and coffees needed a festive spin with homemade marshmallows, flavored with Torani Salted Caramel Syrup. Making your own marshmallows seems daunting, but it’s actually a very easy recipe to follow with just a few tips. First, make sure you have a thermometer on hand to watch the temperature to get the mixture to heat to the right levels. Use parchment paper in the pan to keep the marshmallows from sticking, and dust your metal cookie cutter with lots of confectioners sugar for easy cutting too. Finally, keep a pair of kitchen shears on hand to trim up the edges of the marshmallows to get crisply defined shapes. 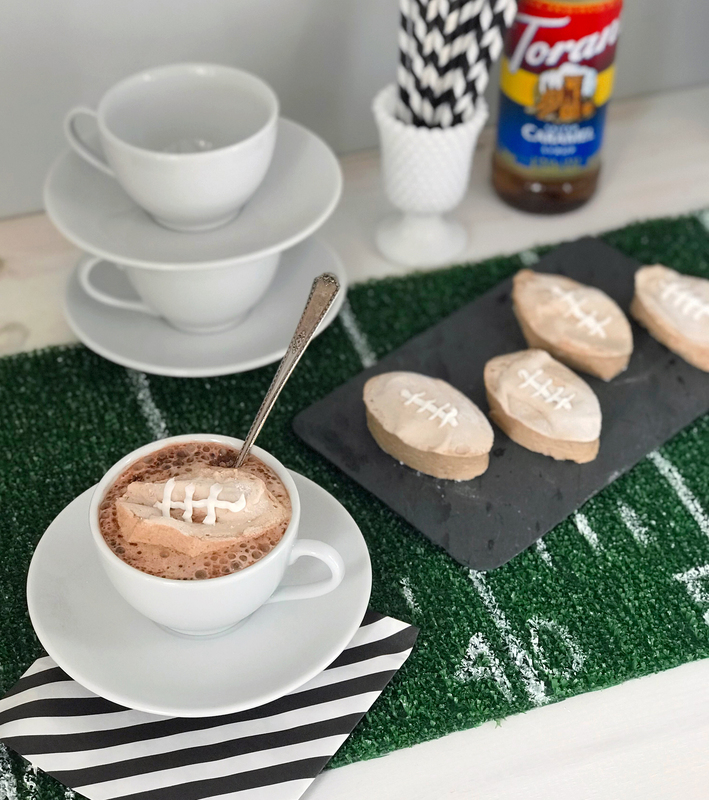 Serve these flavored football marshmallows with coffees, cocoas, and hot cocktails, and you’ll have sweet sips that will keep you warm and spirited as you root on your team! Combine gelatin with ½ cup of cold water in a stand mixer bowl. On the stovetop, combine granulated sugar, corn syrup, cocoa powder, Torani Salted Caramel Syrup, vanilla extract and ½ cup water in a saucepan over medium heat until the sugar dissolves and the syrup reaches 240 degrees. Remove from heat and slowly pour the sugar syrup over the dissolved gelatin in the bowl of a stand mixer. Whip on medium-high speed until mixture thickens, for about 15 minutes. Pour the mixture out into an 8x12 baking dish lined with parchment paper and lightly dusted with confectioners sugar; rest in dish overnight. 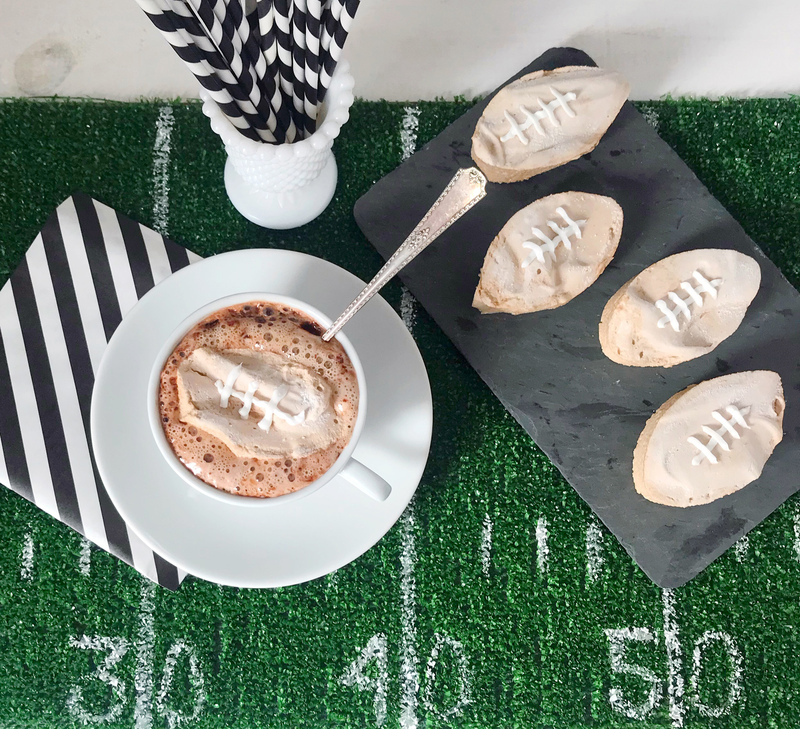 Turn solidified marshmallows out onto a cutting board and cut with a football cookie cutter; decorate with white icing to create football laces. Please note: This post was created in partnership with Family Circle Magazine and Torani. All opinions, ides, and images are my own. Thank you for supporting brands that support this site! Crispy Panko Brussels Sprouts Pasta. Thirty-Three.